Last year resistance in Mayo was incredible. 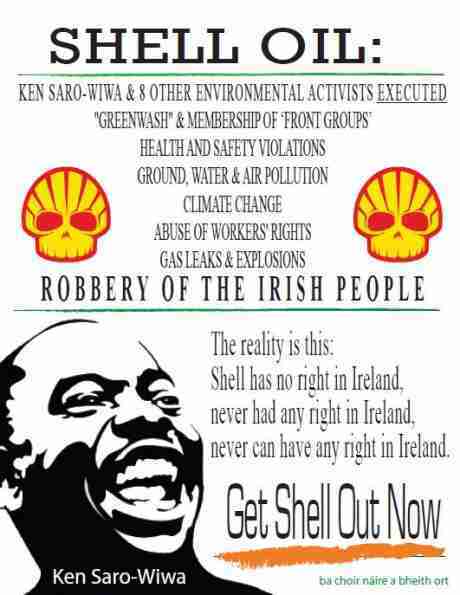 Shell's Solitaire pipe laying ship was forced to leave Irish waters with no pipeline laid! This year resistance continues, and the ship will be forced to leave once again. Come to this year's Rossport Solidarity Camp Gathering to find out more about the campaign, share skills and make plans for another summer of Action. History of the Shell to Sea Campaign. Tours of the local area. 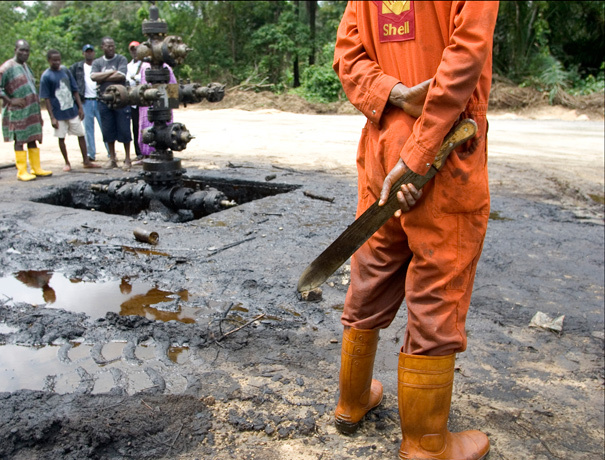 Drawing links with the Wiwa -v- Shell trial in New York. Direct Action training for land and water based action. Facilitation training & Consensus Decision Making. Health, Safety and Environmental impacts of the Shell Corrib gas project. Corrib and climate change: Shell to Sea or Shell to hell? If you know any bands/musicians, want to play music, know people who would like to run skill share workshops, want to help with the kitchen crew, help with children's events or a creche, volunteer during the gathering, or help with publicity then please do get in touch. 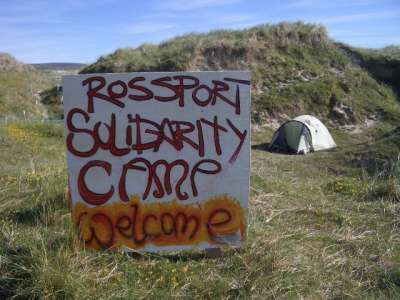 The Gathering will take place at the Rossport Solidarity Camp on the coast at Glengad. Bring a tent, sleeping bag, wellies, raingear and a torch. 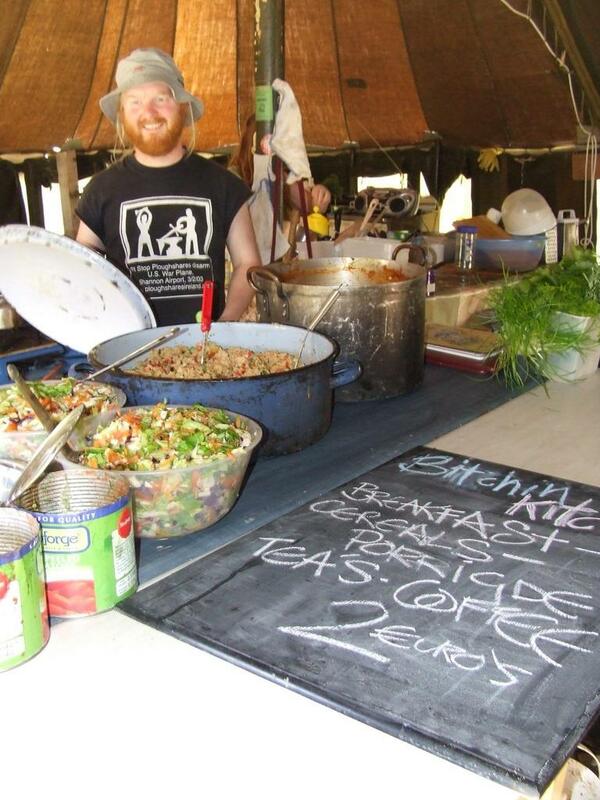 However if you need a bed in the camp house let us know in advance and we'll make every effort to accommodate you. Meals will be provided at the camp. Fair play to the camp for organising this amongst all other business. Can heartily recommend coming to this event after so many successful ones in the past. The bond between community and national and international support is special at these events. What about the Afri walk? What about the Afri Famine walk on May 30th? It's being led this year by Willie and Mary Corduff, with Philip Ikurisi from the Niger Delta. Would it not be better to avoid a clash with this? Those who can get sponsorship will do the Afri walk; how far is it to be? Is there transport being provided? Here's a poster for the June gathering. There will probably be extra cars and possibly buses coming up so contact us if you don't have a way. There will be a 50 person bus leaving Galway early Saturday morning (8/9am 30th May) and returning to Galway Monday 1 June. We are hiring from Mcgrath's and it will cost €15 per person, return. Seats need to be finalised ASAP so if you want a spot on the bus, please contact us: galwayshelltosea@riseup.net, or 086 159 0934. If anyone is traveling from Clare or Cork or anywhere 'down south' and you would like to hop on our bus, just get in contact and we could even sort you out with a place to stay in Galway friday night if you'd like. is there a bus going down from Dublin, or spaces in cars? There will be a bus going from Dublin on Sat morning, returning on Monday. There are places available but try and get in touch as soon as possible to ensure a seat. Tickets cost €30 return and must be arranged in advance. Text/call 0876164440 or email dublins2s@gmail.com for more details. 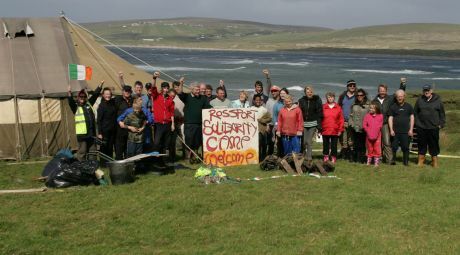 The Annual Rossport Gathering is taking place this June Bank Holiday and Dublin Shell to Sea is running a bus to ferry all campers down the whole way to the camp. We'll be leaving on Saturday morning at 8.15 from Dublin city center, and we'll be returning on Monday evening. Campaign Update, Know your legal rights, Women of Erris. Entertaining ourselves at the camp / pub. Afternoon Workshops, Films and Tours of the local area. Fundraiser organised by local residents. Always great craic. Weekend Evaluation & WHAT NEXT? requested for meals and gathering expenses. publicise this event as well as ye can, this week. and cities. Or even get them into local newspapers. And Social Centres. Come early if you can to help with set-up and organising. time to come is Now. 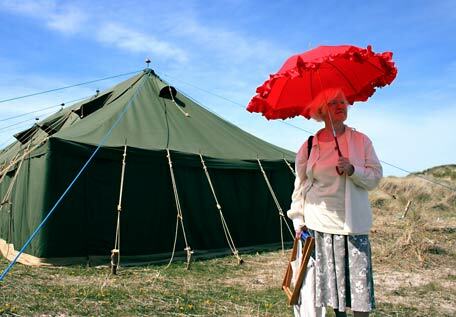 Bring a good tent if you have one, wellies and waterproofs, torch and penknife. To camp, you'll need a good tent (not a weak Lidl or Aldi tent), a good tent with good guy ropes. 'Eurohike' brand are value for money quality tents, 'Vango' are the best but they're expensive. Wellies, raingear and a torch. Hi everyone, we are sending the bus from Galway to gathering, but there are some people who need to get back earlier than on Monday/the bus times don`t suit them from different reasons. 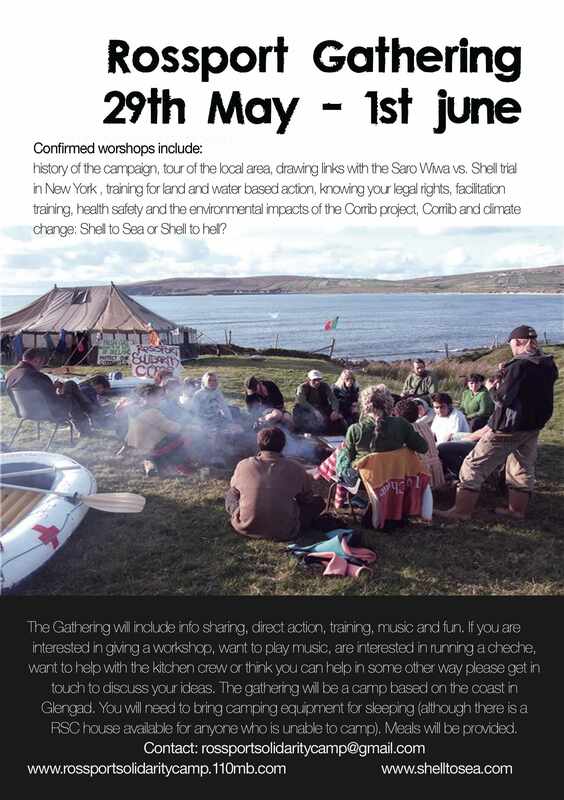 If there are any people driving by car and willing to give a lift to someone could you please contact galway shell to sea 086 159 0934 so we could get more people up there. Fog up the river, where it flows among green aits and meadows; fog down the river, where it rolls defiled among the tiers of shipping and the waterside pollutions of a great (and dirty) city. Fog on the Essex marshes, fog on the Kentish heights. Fog creeping into the cabooses of collier-brigs; fog lying out on the yards, and hovering in the rigging of great ships; fog drooping on the gunwales of barges and small boats. Fog in the eyes and throats of ancient Greenwich pensioners, wheezing by the firesides of their wards; fog in the stem and bowl of the afternoon pipe of the wrathful skipper, down in his close cabin; fog cruelly pinching the toes and fingers of his shivering little prentice boy on deck. Chance people on the bridges peeping over the parapets into a nether sky of fog, with fog all round them, as if they were up in a balloon, and hanging in the misty clouds. Just wanted to share my excitement for this year's gathering! I was lucky to be able to tag along last year while traveling through Ireland, and this year should be just as great, if not better!